Beautiful, thoughtful creations bespoke to you and your customer’s needs. It all starts with research: target audience, requirements, competitors, popularity and core requirements – this forms the basis for all we do. This forms the basis of our web specs – clearly showing the functionality and requirements of your project. 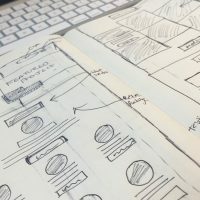 Prior to taking care of the aesthetics, we develop wireframes that will outline the basic structure of key sections on your site. Our process place User Experience (UX) at the forefront of your site. user will move through their site. We have a long history of producing award-winning concepts across multiple devices. Our global clients rely on us to produce in-depth, research-based and beautiful concepts that allows for user-friendly web experiences. Concept creation is a detailed process based on research and experience. We take this seriously and produce in-depth and fully detailed concepts taking into account UI and UX at the heart of everything we produce. Our responsive designs are aesthetically astute and future proof. Wibble produces award winning, bespoke concepts. We have worked with everyone from sole traders to governments.